Click on the above image to go to Diamond Distribution's official FCBD website. 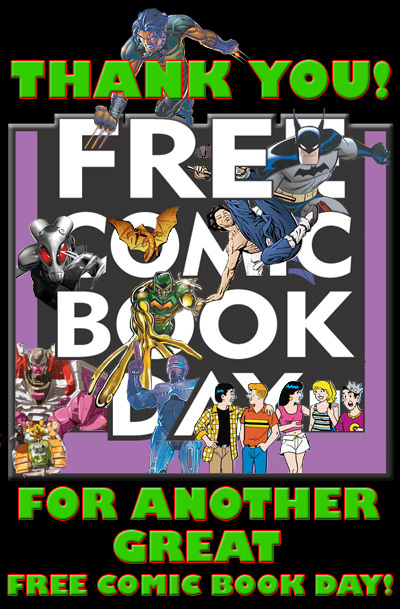 "Free Comic Book Day was originally conceived by Joe Field of Flying Colors Comics & Other Cool Stuff, in his monthly column in Krause Publications' Comics & Games Retailer magazine. FCBD is the first concerted outreach campaign sponsored by comic book retailers, publishers and Diamond Comic Distributors. The goals of FCBD are simple: to reach out to new comic book readers, to call back former readers and to thank current fans. FCBD organizers believe there is a comic book for every reader, so we make the invitation to everyone to visit a comic book store to discover all the great things going on in comics today!"